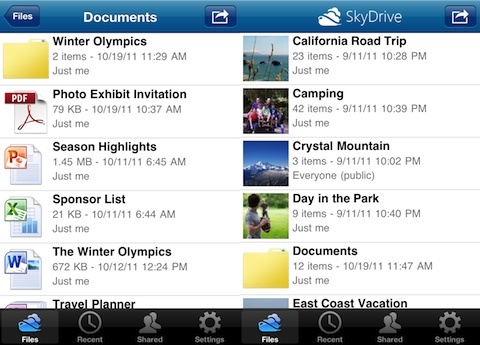 SkyDrive is a file sharing iPhone and iPod touch app from Microsoft that gives users 25GB of online storage space for files that allows them to share those files with others. The application lets users access files from any Internet browser or Internet capable device. This program’s main concept is file sharing. Word documents, .pdfs, images, video, audio, and other files are accessed from an online storage space, and then shared. This iPhone app eases sharing by linking directly to this online space. By selecting a document from the folder, a user is given options to “view” the document or “view and edit” the document. Viewing brings the document up only for the user. Viewing and editing allows a user to share that document with another person. Once the photo is marked for editing, an e-mail program pops up with everything prepared for sending. All that is required is the receiver’s e-mail address. Since it’s a Microsoft application, it works with the list of programs available through the Windows corporation. Word, Excel, Hotmail, and Windows Live are either already programmed to link with SkyDrive, or only require another app download. 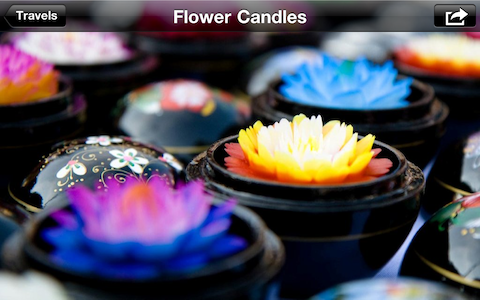 The design is simple and similar to many apps on the market. Files are displayed in a horizontal list of folders. Each folder thumbnail contains a title, the number of items, the date it was created, and who created it. Document folders are displayed as standard Windows’ manila folders, while photo folders display one of the images from the album as a thumbnail. All of the swiping, scrolling, and selecting controls are similar to most applications for iPhones and iPods. One of the key strengths of its design is how quickly and seamlessly the files load and appear on the screen. Swiping through photos has very little lag. Larger files will slowly materialize at first, but then are easier to load later. This was tested with a good Wi-Fi connection, though. Weaker signals and slower connections may skew others’ performance. On top of this, any files located on the iPod touch can easily be selected and loaded to the online storage area through this iPhone app. It also gives users the option of sending links of entire albums to others. Overall, this program works wonderfully and had very little problems. However, other reviewers mentioned problems with it lagging or crashing. Whether or not this was due to Wi-Fi connections or the program was indeterminable. For people needing to share multiple files with groups of people while on the go, this is a wonderful addition to any mobile device. It may also serve as a decent means of getting around picture text fees. However, for simple users with mobile plans that allow free picture texting that don’t need document sharing, this isn’t for them. AppSafari review of SkyDrive was written by Darius Reimm on December 18th, 2011 and categorized under App Store, Featured, Files, Free, Net, Utilities. Page viewed 4970 times, 5 so far today. Need help on using these apps? Please read the Help Page.